Clear Pallet Cover, Giant poly bags, Clear Bin Liner, Riverside Paper co.
Our expanded list of Plastic Pallet Covers will fit just about any of the most popular pallet sizes used in America. With over 100 sizes available your palletizing just got easier. If you don't see the size you need for your application...just call, we can do a special run...low minimums for custom Pallet Bags. 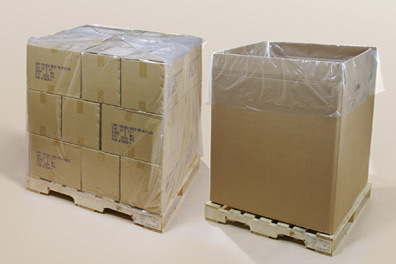 Use our these poly covers as bulk bins liners or Gaylord box liners. Extend the life of your Gaylord boxes. Reduce the time spent cleaning out bulk bins and boxes. Plastic pallet covers and Bulk Box and Bin Liners are available in over 100 sizes in 1.5 mil to 4 mil poly.